International Journal of Research in Health Sciences,2014,2,1,369-371. 1Associate Professor, 2Assistant Professor, 3,4Post graduate, 5Professor and HOD, Upgraded Department of Pathology, Osmania General Hospital, Hyderabad, A.P., INDIA. Myxopapillary ependymomas are benign tumors of WHO grade I which are common in conus medullaris, filum terminale and cauda equina. Though benign, recurrence and metastasis are not uncommon hence, long term follow up is required. Here we present a case of recurrent and metastasizing myxopapillary ependymoma in 23 yr old female in spinal cord at D6-D10 level and 4th ventricle of brain. 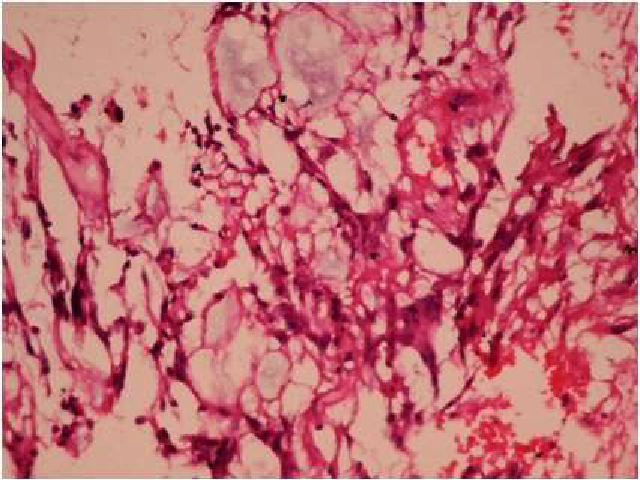 H& E 40X Histopathology showing myxoid areas with papillary structures lined by cuboidal cells.